In the context of the European Collaborative Housing day at the ISHF 2019 (International Social Housing Festival), CoHabitat Network has launched the European Collaborative Housing awards 2019: Reinventing affordable housing from the bottom up. The call for submissions is open for outstanding collaborative housing initiatives from across Europe that have created affordable and inclusive housing solutions. More information here about the call and the Festival. Submissions from collaborative housing initiatives that have created affordable and inclusive housing solutions in Europe. In March 2019, the Co-Lab Research Group at TU Delft celebrated its 1st anniversary since its creation. To mark this occasion, we have produced a newsletter that brings together key milestones and achievements during this year. We would like to share this with you and take the opportunity to thank each of you for working with us and/or for engaging in one way or another with our activities. We hope you find this interesting and look forward to another year of fruitful cooperation! This international conference marked the beginning of the debate on collaborative housing in Portugal. It was organized by Hac.Ora, a recently created association aimed at promoting collaborative housing initiatives in Portugal. Sara Brysch presented an overview of how research on collaborative housing is being developed in Europe and highlighted the contribution of Co-Lab Research. Just released: video about the Samen Wonen, Samen Onderzoeken project!! CHEOPSx is a series of lecture and debate events on hot topics in the built environment, organised by CHEOPS – Student Association of the Built Environment, department of the Built Environment at the University of Technology Eindhoven. This event, moderated by University Lecturer Sophie Rousseau, focused on ‘communal living’ and included presentations by Sara Brysch and Dr. Flip Krabbendam. The further discussion was around the different design approaches used to develop community-oriented housing. The seminar was part of the Co-Lab Research one-year action research project ‘Living Together, Researching Together’ (Samen Wonen, Samen Onderzoeken) funded by the NWO Smart Urban Regions of the Future (SURF) Pop Up grant. The event brought together professionals, residents and researchers from the Netherlands, France, Austria, Sweden, Belgium, the UK and other European countries to discuss findings of the research and to learn from similar experiences abroad. The seminar included presentations about collaborative housing in Vienna, Brittany (France), Stockholm and Antwerp, parallel thematic workshops and panel discussions. During the day, participants discussed how residents can best self-organise to govern and manage their housing; how housing professionals can provide efficient and effective support to residents’ groups in line with their organisational goals; and what Dutch collaborative housing can learn from international examples. The colloquium brought together case studies of recent social housing projects from Italy (Milano) and the Netherlands (Amsterdam and Utrecht), which apply principles of self-organisation and social mix. These initiatives aim to promote social integration of vulnerable members of the housing community, such as young refugees. Throughout Europe, the scenario of self-organised housing comprises a variety of innovative approaches, and reflect the great diversity of social housing systems in Europe. Darinka Czischke presented preliminary findings from the NWO-funded project Samen Wonen, Samen Onderzoeken, particularly on the potential of collaborative housing approaches combining social mix and collective self-management to improve integration outcomes amongst refugees. The seminar “What can civil society do for the city? A North/South perspective” was held in the Department of Management in the Built Environment at the Faculty of Architecture of TU Delft. The seminar was organised by Luz María Vergara in the context of her PhD defence, and counted with the participation of Dr. Darinka Czischke from TU Delft and Dr. Ignacio Irarrázaval from Catholic University of Chile. The discussion was chaired by Dr. Diego Sepúlveda from TU Delft. The seminar discussed the role of civil society in urban development and co-production of the city from the Latin American and European perspective. Darinka Czischke presented insights into the North perspective by discussing collective agency in housing and urban processes in Europe. Ignacio Irarrázaval presented insights into the South perspective by discussing the results of the research project Sociedad en Acción (Society in Action) which focuses on the role of civil society organisations in the development of social programmes in Chile. The Housing and Communities Research Group held a conference to connect international academic research, local community activism and policy debates and support community-led housing in Birmingham and the West Midlands. To see the report of the conference, please click here. Please reply to the OTB Secretariat (secretariaat-OTB@tudelft.nl) Friday November 16 if you want to participate. For more information click here. > How can residents best self-organise to govern and manage their housing? > How can professionals of housing corporations provide efficient and effective support, in line with their organisational goals? > What can Dutch collaborative housing learn from international examples? This international seminar is part of the Project Living Together, Researching Together (Samen Wonen, Samen Onderzoeken), which seeks to answer the above questions. Since January 2018, the project has followed two Dutch cases of co-operation between housing corporations and self-organised tenants’ groups to learn about the pitfalls and successes of their collaboration process. The aim of this seminar is to bring together professionals and residents from the Netherlands, France, Austria, Sweden and Belgium in order to discuss the findings of the research and to learn from each other. Vincent is currently Head of Department of Management in the Built the Environment, at the Faculty of Architecture and the Built Environment, where he graduated in 2001 with a thesis entitled ‘Financial-economic fundamentals for housing associations’. He has participated in various faculty committees, including the core group of Architecture Curriculum Renewal (CURVE). Together with Darinka Czischke, he was awarded the NWO VerDuS Pop Up grant for the project ‘Living together, Researching together’ (Samen Wonen, Samen Onderzoeken). Darinka is assistant professor at Faculty of Architecture and the Built Environment, TU Delft. She is an urban and housing specialist with over 17 years of international experience in research, teaching and consultancy. In 2015 she co-founded the working group on Collaborative Housing at the European Network of Housing Research (ENHR). In 2017 she founded Co-Lab Research, where she leads the NWO-funded project ‘Living together, Researching together’ (Samen Wonen, Samen Onderzoeken). Carla Huisman is a sociologist who has studied the role of citizen participation in legitimising displacement, the precarisation of the Dutch rental housing market and the non-enforcement of regulations as a technique of governance. She is currently finishing her PhD thesis entitled ‘Insecure Tenure’, at the University of Groningen. Carla currently works as post-doc researcher on the project ‘Living together, Researching together’ (Samen Wonen, Samen Onderzoeken). Stephanie works as a trainee architect at Inbo in Amsterdam. She graduated with a MSc Architecture from TU Delft in 2016 on the topic of cooperative housing. She is primarily interested in researching the potential for cooperative housing models to create affordable housing in cities in the Netherlands. Next to that, she works as a part time research assistant on the project ‘Living together, Researching together’ (Samen Wonen, Samen Onderzoeken). Ernst Gruber is an architect, researcher and moderator based in Vienna. Within the interdisciplinary team at wohnbund:consult he is responsible for developing and realising innovative housing concepts. He has been board member of the Austrian umbrella association for collaborative housing since its founding in 2009. Kerstin Kärnekull is an architect, who has worked with various housing issues for most of her life. She is a founding member of the group Bo i Gemenskap (‘Living in Community’). She is also editor of the website of the national Swedish Association Kollektivhus NU/Cohousing Now kollektivhus.se and of the electronic newsjournal Bo tillsammans/Living together. She lives in the cohousing Färdknäppen for more than 25 years, the first ‘second half of life’ collective housing in Sweden. Samuel Lanoë is an environmental engineer involved in the development of collaborative housing. Since 2006 he has been supporting several citizen groups and social and cooperative organisms in Brittany (FR). He also carried out a study on cooperative approaches between groups and social ousing organisations. He will soon move with his family into a collaborative housing project in Dol de Bretagne (a 23-units social housing complex). Anneloes Van Osselaer is an all-round project worker and training coordinator for the innovative project CURANT (Cohousing and case management for Unaccompanied young adult Refugees in ANTwerp) since 2017. This project is an urban intervention offering various types of support to unaccompanied young adult refugees in the city of Antwerp (Flanders, Belgium). She has a Master degree in (Visual) Sociology (University of Antwerp) and tries to implement visual methods during the training sessions in CURANT. Dr Darinka Czischke was invited to be one of the speakers at Moscow Urban Forum 2018. Presenting in two panels entitled ‘Mass Housing as Innovation Driver. Best Practices from Global Megacities’ and ‘Rented, Smart and Shared Models for the Future Housing’, Dr Czischke established connections between the challenges of social housing and the opportunity to introduce collaborative approaches in the political agenda. For the third consecutive year, Dr Darinka Czischke took part of the Summerschool ‘Sustainable Housing from a European Perspective’ as one of the speakers and workshop leaders. Her lecture entitled ‘Collaborative and sustainable housing approaches in Europe’ sought to provide a deeper understanding of the scope of Collaborative Housing initiatives and what are their main drivers. On one of the hottest days of the month, 27 May, Darinka Czischke and Carla Huisman gave two workshops at the Platform 31 day conference on Dutch housing cooperatives in The Hague. The sessions, prepared by Stephanie Zeulevoet as well, were well attended and introduced the participants to Austrian, French and Swedish forms of collaborative housing. Together, we looked at the different organisational models and explored what we could learn from them for the Netherlands. An interview with Darinka about European forms of collaborative housing can be found in the new magazine Platform 31 presented at the conference, reflecting on the popularity of collaborative housing in Europe. Built Environment production, habitation and management inevitably involves a complex interaction between heterogeneous entities. As lecturer in Architecture and Sustainable Design at the University of South Australia, School of Art, Architecture and Design, Dr Palmer’s research is interested in processes of change and disruption, and how design[er]s respond to controversy and failure. With a particular focus on housing, she proposes the employment of an actor-network lens to think relationally about housing provision. The co-ordinators of the ENHR working group “Collaborative Housing” invite abstracts related but not limited to this year’s ENHR conference topic, with a particular focus on the links between collaborative housing forms and social cohesion. 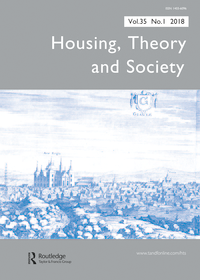 In addition to the themes of the Working Group, this year we would like to particularly encourage papers addressing “Collaborative Housing in Nordic countries”.